When I’m not fishing mainly Natal Fly Fishers Club waters, I spend the rest of my fishing time on one of South Africa’s finest stillwaters, Highmoor. At just over 2000m above sea level, it is wetland fed and about as pure as one could imagine. The water remains cool and crystal clear throughout the year, supporting enormous populations of tadpoles, caddis, mayfly and midge. The midge pupa ( Chironomidae ) found here are predominantly brown and not black like the ones we find in the lower altitude waters. I decided that although we were picking up fish on the traditional black midge patterns, we needed to match the hatch a little closer and so the brown, soft hackle midge was born. 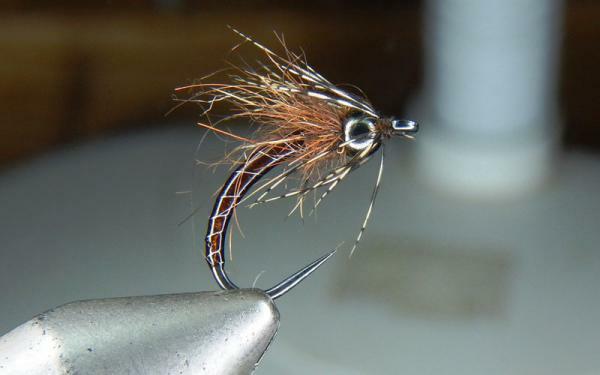 The fly worked from the first cast and has been a revelation in all clear, waters since. Hook: Tied on Hanak #12 H310 barbless buzzer. Secure the bead 2 mm from the eye of the hook by tying a figure of eight either side of the bead. Three or four secured threads over the top of the bead will suffice. Build the body by flattening the thread to obtain the maximum amount of sheen while ensuring a fine taper. After building the body and tying in the ribbing whip finish the fly off, 2mm behind the bead. Apply a thin coat of UV resin and cure. Ensure the 2mm section contains no resin. Attach the thread behind the bead and make a dubbing loop. Spin the dubbing and wrap it in ensuring the fibers are not trapped. Whip finish just behind the bead for durability purposes. Take the thread over the bead. Tie in the partridge feather by holding the base of the feather in your left hand, curving away from you. Make 2 wraps clockwise from the bead toward the eye of the hook, while pulling the fibers backward. This ensures the feather is palmered correctly. Whip finish and varnish the eye. When to fish the fly: 365 days a year, as Chironomidae’s are present all year round and are a trout’s main source of food. Where to fish: Where you find a muddy bottom. This is where the blood worms live and feed and evolve. The trick is to determine the depth at which the midges are at. How to fish the fly: I fish the fly on a floating line with a long leader. I prefer to fish it with another lifecycle below it, the blood worm. You can however use an intermediate or a sinker should you not be getting deep enough. Counting your sink rate down will ensure that when you do find the fish that you can constantly return to the same depth. Retrieve: The most effective. Firstly, fishing it static with the occasional inch retrieve to impart life and induce a take. Secondly to cast it at a 45 degree angle to the wind. Allow the fly to sink by mending against the wind. When you feel the flies are at the correct depth hold onto your line and create tension which gets your fly swinging up from the bottom and thus inducing a take. Tip: Imperative to keep an eye on your leader during the drop and the tip of your fly line for any subtle takes during the retrieve.